I Can't Stop Thinking About Jim Nantz Calling Tom Brady "Mr. 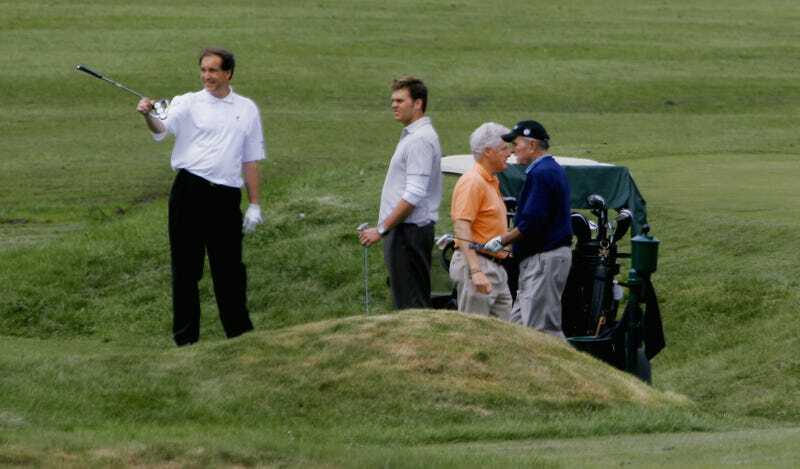 Cool"
In what might be the whitest photo caption ever written, Jim Nantz and Tom Brady play golf with former Presidents George H.W. Bush and Bill Clinton at a fundraiser in Kennebunkport, Maine, in 2006. Jim Nantz is too fundamentally bland as a human for a conflict of interest to be concerning, but what fresh hell was this? During Sunday’s Patriots-Steelers game, the CBS broadcaster betrayed his WASPy exterior with an ejaculated moment of unrestrained happiness for his good chum Tom Brady. “Mr. Cool”? What? This was two days ago, and it still refuses to leave my brain. Touchdown Tom and Tom Terrific are somewhat established nicknames for the Pats QB, but let’s stop this one right here. “Mr. Cool” should be smothered with a pillow. You know Nantz dropped “Mr. Cool” right there because he knew that if Brady threw a TD pass on that play, it would’ve been immortalized on some highlight reel. Thank God the pass fell incomplete. What Does This Profile Make You Think About Jim Nantz?